May 2005. Images taken from 35mm prints. You may remember the abandoned Fine Arts Building that once stood at 44 W. Adams in Detroit; now demolished and reduced to a standing facade. I climbed that facade in another post: "Not for the Faint of Heart." Anyway, back in 2005 the building was still standing and we made a trip inside. This was an older structure than we were accustomed to seeing downtown, and we weren't prepared for the level of rot that we found inside. Very little of the seven-story building was actually explorable we found out, due to its being in such a horrible state of decrepitude, with a massive hole having collapsed through multiple floors. Not surprisingly, this hazardous wreck was owned by Mike Illitch. We noticed it had been extensively modernized over the years, probably remaining in business until the late 1980s. But certain queues gave away the building's true age; the staircases were completely of wood, as were the building's main supports, many of which had rotted and collapsed years ago, leaving gaping chasms in the floors. This decaying seven-story corpse was turning exactly 100 years old during our visit. You might also recognize that by 1905, tall buildings were already being built with steel beams, not wooden ones. Yet this building resisted that trend for whatever reason and was completely hewn of timber and masonry. I remember finding the darkened stairway from the lobby and being impressed with its fancy wooden bannisters, then finding a dead rat lying right in the middle of the first flight of steps. The Fine Arts was a speculative office tower opened in 1906 by prominent businessman Hugo Scherer "to accommodate especially the fine arts trade in Detroit," and it was designed by local architect Louis Kamper. Scherer also started the Adams Theater (see below), and owned the Strand and Garden Theaters. According to coachbuilt.com, Hugo Scherer (not related to the infamous Mexican banker of the same name) was a pharmacist who got into hardware and carriage goods. By 1887 he headed the H. Scherer & Company, then known as Detroit's preeminent supplier of wholesale carriage hardware, and had begun manufacturing his own line of carriage dashboards. He eventually pursued the growing carriage works business, and followed the trend as it blossomed into the automobile business. Scherer was a major stockholder in the Wadsworth Manufacturing Co., and he and Frederick Elliott Wadsworth later organized the Detroit Engine Works in 1896, manufacturing marine and agricultural engines. By 1904 Scherer and Wadsworth went all-in on the auto industry, and reorganized as Detroit Motor Car Supply Co., making automobile body parts. Scherer was also president of the Detroit Forging Co., the Michigan Steel Boat Co., and a founding member of the Detroit Automobile Club. He lived in a mansion at 745 E. Jefferson and commissioned Louis Kamper again to design him a rich Grosse Pointe summer residence, near Frederick Wadsworth's summer home. Scherer even once owned what is now the Michigan Governor's summer mansion on Mackinac Island. His mausoleum at Woodlawn Cemetery shows that he was definitely a lover of art and architecture. 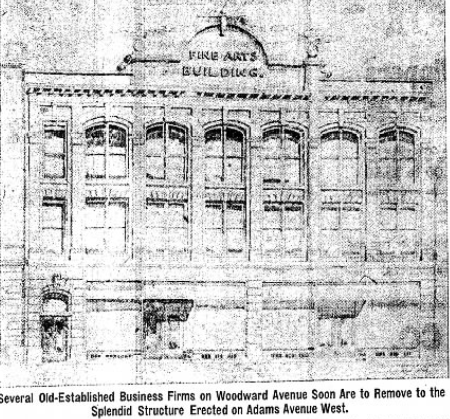 Back to the Free Press articles again, it was said that several "old-established" business firms were to relocate here from Woodward. The George R. Angell Co., dealers in "Kodak supplies and art goods," was to occupy two stores in the Fine Arts Building that would also have gallery space dedicated to featuring art on loan from across the country and abroad. Their aim was to have one of the finest galleries in the western U.S. The C.M. Hayes & Co., photography studios would also occupy a large part of the building, much of which was designed specifically for their accommodation. The interior was designed by Mr. De Yonge Smith Free Press articles stated, which boasted of the beautiful colors the Hayes Co. studio rooms were painted in—there were also chandeliers, dark oak trim, and some stained glass windows. But judging by a Free Press article from August 1906, the Fine Arts Building took its name from the Detroit Fine Arts Academy, which would occupy "commodious quarters" on the top floor, having relocated from the Trowbridge Building on Witherell Street. The new Fine Arts Building was especially fitted to meet the demands of a growing and up to date school of art, the article stated. The Free Press touted the merits and reputation of the academy and its classes, listing off several alumni who had gone on abroad to earn careers in the field or art and art instruction, and admitting that several of its own newspaper illustrators were former pupils of the academy. The Detroit Fine Arts Academy offered day and nighttime classes, as well as Saturday classes for kids. Joseph W. Gies was its president, whose painting "Lady in Pink" you may recognize hanging in the Detroit Institute of Arts. Another example of Gies' work resides in the Scarab Club. "Special skylights and special light effects" were included in the design of the top floor for the "Gies model art school." The whole building was designed to be a haven for the arts, and "Architect Kamper has given this entire matter a great deal of thought and study." Confusingly, I read in a c.1909 article that there was apparently another structure called the "Fine Arts Building," on the grounds of the Detroit Exposition (also designed by Louis Kamper). The Vinton Co. would also occupy space in this building for its new decorative art department; this was of course 12 years before they erected their own Vinton Building on Woodward, which I explored in an older post. Negotiations were ongoing with still more Fine Arts tenants, and some floors were reserved for physicians. The lobby had been turned into a faux...something...resembling a series of Parisian shops. Ooo la la! With, of course, a huge bar. Sacré bleu! I think maybe we should keep these kinds of booths around and reinstate them as a social custom—so that people have a place to use their smart-phones. The point of the telephone booth was not only to keep your phone conversation from being rudely interrupted by others in the room, but to keep your phone conversation from rudely interrupting others...! Going back downstairs several floors, I eventually figured out how to get over to the Adams, a more modernized, but no less trashed hell-hole. David Kohrman of forgottendetroit.com notes that the Adams was an example of the rare "alley-jumper" style of theater. I never knew that was even a thing. The interior was a mess. It was hardly recognizable as a classic movie house. Apparently this one had also seen the attention at one time of our local architectural preservation group, Preservation Wayne (of which I was a member). They are now known as Preservation Detroit, and I am still a member. I surmise that the Adams was once a stop on their popular downtown historic theaters tour before it became too hazardous. This one—along with 44 other Detroit venues—had been designed by famous local theater architect C. Howard Crane. It was originally configured for 2,000 seats. The Adams Theater is not famous for much...except the fact that, according to the Bowhunters Hall of Fame, it was where the legendary Fred Bear's passion for archery was kindled, after seeing the movie Alaskan Adventures here in 1927! He had originally come to Detroit looking for work in the auto industry, and found employment as a pattern maker at Packard Motors. According to the story, his experience at the Adams Theater changed Fred's life, and he went on to seek out the star of the movie, Arthur Young, who he then apprenticed under before founding his own bow-making company in Grayling, Michigan. Fred Bear was an incredible target shooter, and almost singlehandedly was responsible for the popularization of bowhunting as a sport. According to Michael Hauser and Marianne Weldon's book, Detroit's Downtown Movie Palaces, the Adams opened in 1917, some months after the Madison Theater, another theater built by the duo of John Kunsky and C. Howard Crane. It was bought and renovated in 1935 by a Chicago theater firm. The Madison and the Adams Theaters represented the birth of the Grand Circus Park Theater district as the new home for luxuriant motion picture palaces and movie-going audiences while the older Monroe Street theater district was fading, as I discussed in my post about the National Theater. Over the years the Adams would host major premieres including The Blue Bird (1940), Easter Parade (1948), Kiss me Kate (1953), Guys and Dolls (1956), Gigi (1958), A Raisin in the Sun (1961), and was the first theater in the state to install the 70mm process projecting equipment. The Adams Theater's balcony was twinned in 1988, providing a second screen in the theater, but it closed later that year due to what Hauser and Weldon called "unruly patrons." I'm guessing that means vandalism. Regrouping out in front of the Fine Arts, we noticed that the long-vacant, but under-renovation Kales Building next door was still open through the excavated basement, as crews were installing a tunnel to a parking garage under Grand Circus. 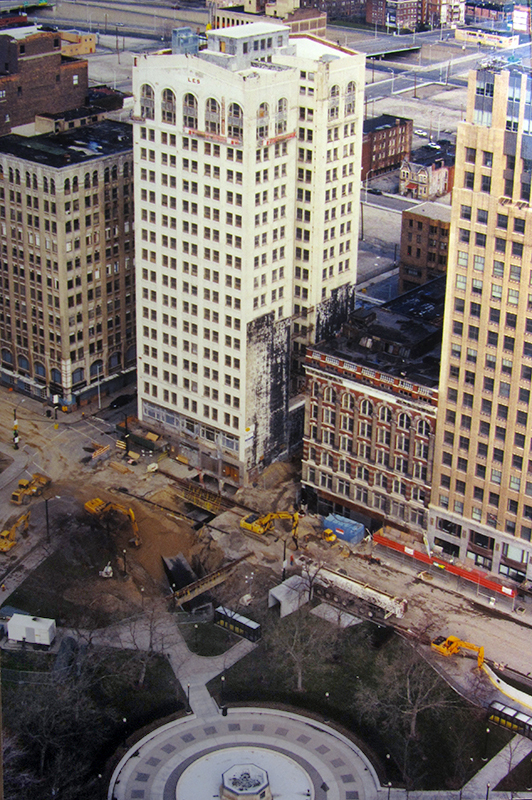 You can see the hole, and the tunnel's roof in this view from the Broderick Tower (at right). Detroitblog John had recently infiltrated the slick-looking Kales (though he said he had set off an alarm), and I had always had a yen for the 18-story tower. I was in the lead as we started moving in for the kill, carefully climbing down into the hole. The steep muddy incline was treacherous, and the soil was very loose, starting to slide. At the last second, I realized that the huge pit below me was completely flooded with deep, brown water. I turned immediately and shouted, "@#$%—GO BACK!" but as I tried to climb back up, the soft spongy earth began to slide under me, down into the lake. Almost panicking, I flopped forward and dug in with both hands, scrambling as fast as I could. If I were to fall, I knew that due to my heavy boots and clothes, I would certainly drown in what looked like 10 feet of murky sewer water. Luckily the others had not yet followed me down, and I made it out again, so we split that scene in a hurry. Walking through Grand Circus Park covered in mud was a little comical, though. Click to continue to part 2: "Not for the Faint of Heart."